Dan McKechnie began his professional career as a sixth grade school teacher in Irvine, California. As a grade school teacher he was honored with the Climate Creator of the Year award, was nominated for National Teacher of the Year and received a California Life Teaching Credential. From this background in public education Dan entered the video & film industry by starting Advanced Video Productions in his garage. As a peace offering to his wife, Debbie, he promised his new home video camera would pay for itself. From this humble beginning, Dan with a childhood friend started video taping weddings. Within a year not only had Dan given up his teaching position but his former school district was one of his major clients. For many years after Dan served as a video production consultant for the Irvine Unified School District creating educational programming and teaching high school students and teachers video production techniques. Within 10 years AVP, had evolved into Advanced Video & Film, Inc. a 12,000 square foot editing facility in Anaheim, California. Equipped with three state-of-the-art edit suites, connected by a multi-format edit deck machine room, a sound studio, movie theatre presentation room and nationwide clientele. As president of AVF, with 85 employees Dan found himself unable to participate in production, spending the majority of his time in administrative tasks. As technology advanced Dan became one of the first editors in Orange County to join the desktop computer world with the revolutionary Avid system. With producing his true love, he liquidated his interest in the facility and formed Moving Images, a video/film production group. Moving Images joined the Southbay Studios family in Long Beach now producing broadcast television in addition to other corporate clients. TV shows, TV specials, commercials, infomercials and internet programming all followed even after Southbay became Thunder Studios. Once again embracing the latest technology, Dan became a Red Cinematographer and repositioned Moving Images into a premier boutique operation in Fullerton. Moving Images offers editing in Avid, Final Cut and After Effects. Dan is married to Debbie, a retired sixth grade school teacher in Fullerton. They have two children who followed in parent’s footsteps. Christopher, an expert cinematographer, and Danielle, who also works in education. They also have six grandchildren. 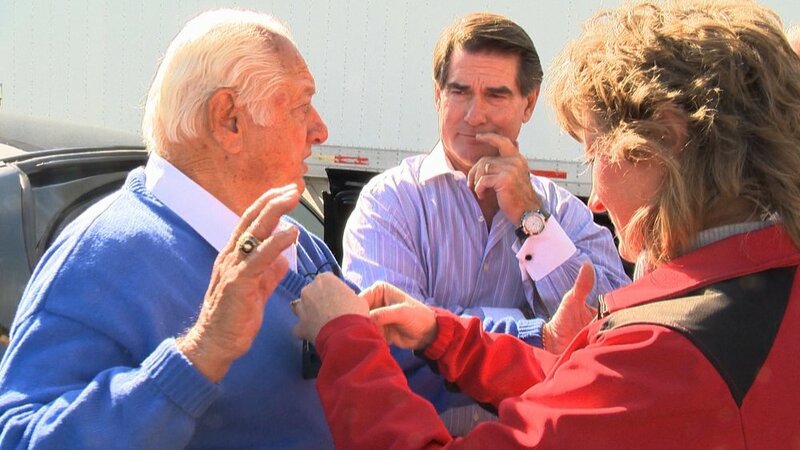 Teri Lawrence Prepping Tommy Lasorda for his on camera performance with Steve Garvey. Teri's background in communications began as a newspaper reporter for the DAILY ARGUS OBSERVER, the area paper in her hometown of Ontario, Oregon. After earning a degree in communications from the University of Oregon, she went on-the-air for KVAN, an A.M. radio station in the Portland, Oregon metro market, serving as a sports and traffic reporter. Teri then joined Avon Products, Inc. to manage representatives in Seattle before being tapped to become the company's youngest spokesperson, appearing on TV and radio talk shows, and in newspaper articles around the West Coast. From there she went to work for the Avon subsidiary Foster Medical, designing a public relations program that encompassed 40 hospitals and 25,000 Christmas gifts in 12 cities on the West Coast. She was later named National Communications Manager for Foster Medical's sister company, InfusionCare. After the sale of InfusionCare to National Medical Care, Teri went on to handle the advertising and public relations effort for the combined NMC/InfusionCare joining ranks with an advertising agency in Orange Country. During this time, she was also active as a volunteer with local, state and national divisions of the American Cancer Society, developing and conducting volunteer and staff training programs while serving as the President of the Pasadena Chapter. Teri has written & directed a number of ACS video projects including national training programs and public service announcements. It was then Teri met Dan McKechnie and was named Director of Marketing for Advanced Video & Film, Inc., which soon evolved into writing and directing for the independent production company, Moving Images. With credits like Star Trek: Deep Space Nine, abc7, the American Red Cross, Southern California Edison and the Mighty Ducks of Anaheim, in 2009, she helped relocated and fundraise for a K-12 private Christian school in the Inland Empire, while serving on their school board. After working as a producer on two national productions for Natural Balance she produced the Animal Planet reality show, Who Let the Dogs Out, appearing on the Hallmark Channel in season two. Teri lives in Upland, California with her husband, Christopher, an architect, their daughter, Jennifer a college graduate from Point Loma, California and their Transylvanian Hound, Buster. Chris McKechnie on location in Tokyo, Japan. Chris McKechnie on location in Tokyo. Chris has been in the business most of his 36 years, behind the camera, working with his father, sister, and uncles since the tender age of 8. Beyond working in the family business, Chris studied photography into college and worked independently at still photography as well as cinematography. and he still makes time to collaborate with his dad at Moving Images. Chris shoots with the Arri and RED and Black Magic cameras. Currently Chris shoots with lots of great support gear including Vintage Lomo Prime lenses, wireless focusing, monitoring, and dolly's. Chris and his wife Elizabeth are the proud parents of Aiden (6), Noah (4) and daughter, Riley (2). If you ask him. Chris will tell you he feels blessed he gets to do what he loves each and every day. Ralph Rebaya specializes in Drone aerial and underwater camera work with Moving Images. Ralph Rebaya is a FAA-licensed pilot with over 20 years of flying experience and is also a Remote Control Helicopter Instructor. Served as a US Army Officer and is an aerospace engineer that has worked for major aerospace corporations such as Boeing, Northrop-Grumman, McDonnell- Douglas, Lockeed Martin, Airbus and Barbardier. Ralph earned a B.S. in Mechanical Engineering from Cal Poly Pomona and an M.S. in Aeronautical Science from Embry Riddle Aeronautical University. Read more about Ralph and Heli Watch here. Third Generation "Future" Cinamatographer after he finishes First Grade. Dan and Chris McKechnie at Movie Premiere.